Fit Fluential Mom: So You Want A Mermaid Tail? So a few weeks ago we were swimming at our HOA pool and a little girl walks in with a mermaid tail. My daughter immediately fell in love with it so I proceeded to ask the little girl's mom where she got it. She said she got it online, so I saved the website on my phone and promised my own little mermaid that we would look them up when we got home. As soon as we got home, she reminded me of what we needed to do. When I looked it up, I couldn't believe that the cheapest one was upwards of $50 plus shipping. I couldn't understand why it was so much, outside of the demand from so many little girls seeing them and wanting them. After all, it was made out of a shiny stretchy fabric and slipped on like a simple straight length tube skirt that flared at the bottom for the tail. So.....after thinking about it, I figured I'd save some money and try making my own. After all, I had a sewing machine and it couldn't be THAT hard. I bought the fabric (about $12 bbecause it was on sale & I had a coupon!) and decided to buy a rubber floor mat at Walmart to use for the tail. The website the little girl got hers from sold some with rubber tails but those were $75 and up! Being the over achiever that I am, I decided to add this to my daughter's. I was definitely getting adventurous. Then, while looking for tips online, I saw the same type of mermaid tail but it was a full dress with a tank style top. Of course, I saw this and figured I could pull this off too. After all, the dress version was even MORE expensive and we're on a tight budget as it is now since we are currently on only one income. So we got home, I pulled out my sewing machine and laid out the fabric. I measured my daughter's width around her chest and decided to do the dress the same width all the way down. I took one of her tank tops and cut out the straps up top for the tank top portion (about double the width of what I wanted the straps to be since I'd have to sew them under). I cut two pieces of fabric into triangles and sewed them on 2 sides. Then I cut pieces of the rubber mat in the same size, placed it inside the fabric triangle (fin) and sewed the fin onto the side of the dress. I did the same thing for the other side and to my surprise, it turned out pretty well. I thought I was done when I saw another piece of fabric on the floor and then decided to make a pleated little ruffle for the front. 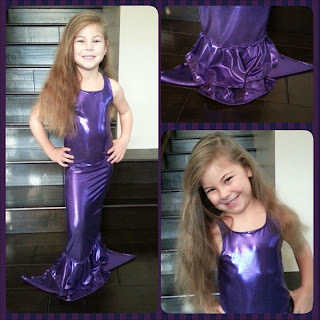 Once completed, we tried it on and I had one very happy little mermaid! So, after completing the "mermaid tail for the pool" we decided it is way too nice and fancy of a mermaid dress for the pool, so we'll be making the swim skirt with fin with the remaining material. And not as fancy or elaborate of course. So moms, if you have a mermaid wanting her own tail and/or mermaid dress, go for it and try making it yourself. If I can do it, anyone can! Up until now, all I'd ever sewn were a few burp cloths and those came out less than perfect, and that's being generous. If you're interested in having me make one for you, contact me via email at theparentcenter@gmail.com. I really enjoyed making it, although it was difficult and took about 4-5 hours, but the happiness in my little mermaid's face was absolutely PRICELESS! I will post pictures of the swim tail when I make that as well too ;-).